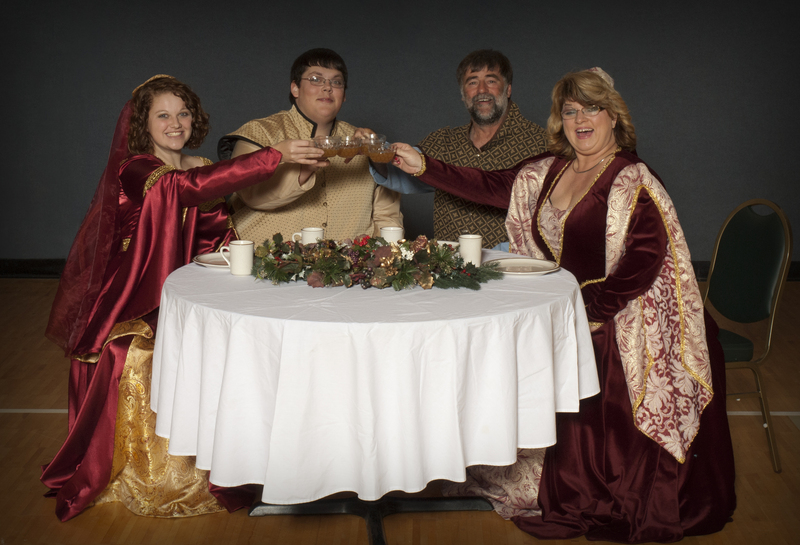 The lords and ladies of the court invite you to raise a cup to the season of joy at the ninth annual Madrigal Dinner at the country estate of Lord William and Lady Elizabeth of Dewart Castle, located at Quaker Haven Camp in Syracuse. Be transported back to the renaissance period of merry old England enjoying a delicious feast provided by the Quaker Haven culinary staff. Experience the wit of the court jester and the talents of the musicians and court jugglers. A pleasant mix of sacred and secular music will be enjoyed by all while dining by candle light in the exquisite banquet room. This will be an evening of reflection, where one can pause to hear the real reason for celebrating Christmas … the story of the birth of Jesus, as told from the Book of Luke. Lord William and Lady Elizabeth would love to have your children to attend as they have set aside special moments for the little ones. This is a way to celebrate the Christmas season with a family gathering or company Christmas party. Reservations are $20 for adults and $12 for children 5-12 years old. • Friday, Dec. 6, at 7 p.m.
• Sunday, Dec. 8, at 2 p.m.
• Friday, Dec. 13, at 7 p.m.
• Saturday, Dec. 14, at 7 p.m. Guests are asked to arrive a half hour before the performance and check in at the podium in the lobby of the dining hall. The performance will last approximately two hours. Call Quaker Haven Camp at (574) 834-4193 to reserve your table and ask for additional information. Quaker Haven is located at the corner of CR 900N and CR 500E at the south edge of Syracuse.